Asphalt pavement is a mixture of graded stone aggregate and asphalt. The asphalt is the binder or glue that holds the pavement together. If left unprotected, asphalt is subject to degradation from oxidation and water penetration. Ultraviolet rays from the sun begin to break down the asphalt binder, changing the pavement surface color from black to gray. Gas, oil and other petrochemicals will dissolve the asphalt binder, causing holes and raveling. As the asphalt binder is further broken down from the sun's rays, water begins to penetrate the surface. Water begins to erode the binder between the individual stones in the pavement. 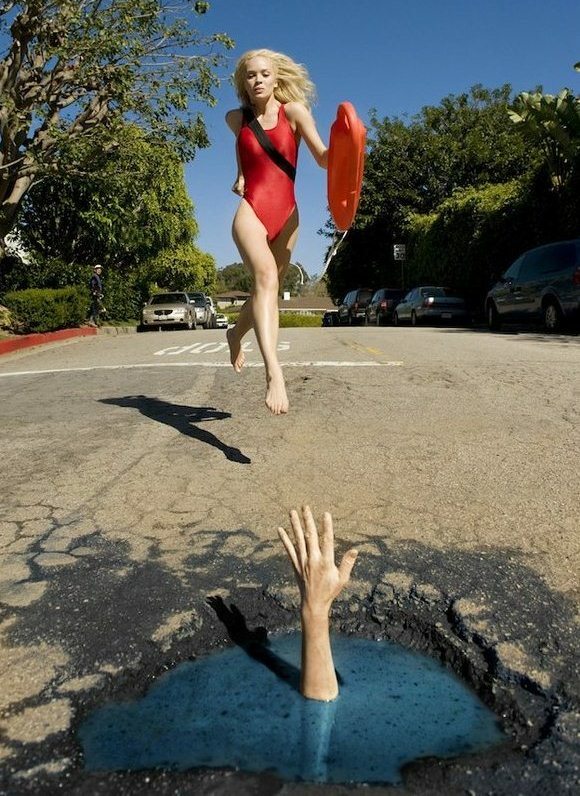 If cracks are present, water will begin to erode the base beneath the asphalt, causing the cracks to enlarge and eventually causing base failure in the form of potholes. In the northern climates, pavement is subject to further damage from normal freeze thaw cycles. Water, in the form of melted snow and ice, enters the pores and cracks in the pavement. When temperatures fall below 32 degrees the water freezes, expanding and causing additional surface erosion and widening of cracks. Pavement sealers are emulsion (water-based) coatings designed to extend the life of asphalt from damage caused by UV degradation, gas/oil, road salt, and prevent water from entering into the pavement which causes the freeze/thaw cycle damage. Re-paving is very expensive and with routine maintenance, you could delay the expense of repaving.This product has been used successfully and safely for over the past 60 years. The refined tar product that pavement sealer is made from makes up approximately 33% by weight in the production of concentrated pavement sealer (that is, sealer that is sold to the contractor and is not ready for application). The other main ingredients in concentrated pavement sealer are water (50%), clay (17%) and emulsifier. During application, the concentrated pavement sealer is further diluted 10 to 40% depending upon mix design and other additives used. Because of this dilution, refined tar may make up only 20-25% by weight of the finished pavement sealer (that is, sealer that is ready to be applied). Typically refined tar-based pavement sealer has a life of around 3-5 years, depending upon traffic and environmental conditions. The typical asphalt-based sealer has a life of 1-3 years, depending upon traffic and environmental conditions. It has been reported that asphalt-based sealers fail in some harsher environments in one year or less. In order to understand what coal tar pitch is, it's important to understand its origins and refinement methods. Coal tar can be refined from a number of sources including coal, wood, peat, petroleum, and other organic materials. 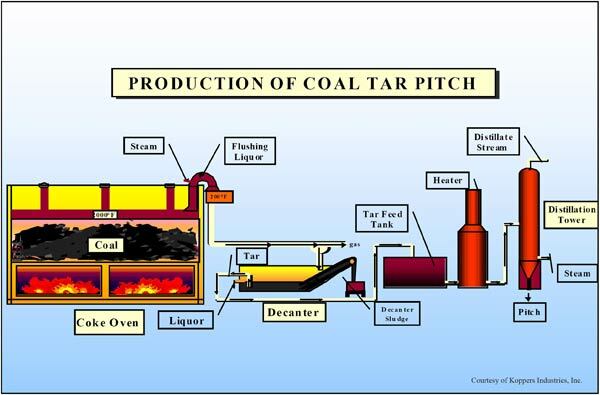 The tar is removed by burning or heating the base substance and selectively distilling fractions of the burned chemical. Distillation involves heating the substance to a point where different fractions of the substance become volatile. The fractions are then collected by condensing the fraction at a specific temperature. A base substance can be split into any number of fractions through distillation. A good example of industrial distillation is the oil refining process. Through distillation, crude oil can be separated into fractions that include gasoline, jet fuel, motor oil bases, and other specialty chemicals. Fractionation or distillation is a tried-and-true method for breaking a substance into different parts of its composition. One of the first uses of coal tar was in the maritime industry. Trees stumps were burned and the tar fractions were collected through distillation of the tar. The tar was then used to coat wood boats. Tar was an excellent waterproofing agent and it also helped to protect the wood from insects. Coal tar pitch consists of a collection of cyclical hydrocarbons of various molecular weights and configurations. Every coal tar pitch can be refined to a greater or lesser degree; greater refinement yields a stiff, glassy product, while reduced refinement yields a highly viscous fluid. Coal tar and coal tar derivatives are used in a variety of industrial applications. Tar pitch from wood is used in soap, food, and medical applications, while coal tar derivatives can be found in dyes and cosmetics. One of the predominant uses for coal tar derivatives is construction material. Coal tar pitch has been used as the base media for coatings and adhesives for many years, including roofing bitumen. Coal tar has historically provided long lasting and sustainable protection for the roofs, roads and parking lots. The inherent waterproof nature of coal tar pitch provides a tight waterproof roof construction. The self-healing properties of coal tar pitch tend to bridge small deformities created by debris, stress movement, hail, and other surface punctures. Further, coal tar pitch is highly chemically resistant, resisting exposure to a large variety of acids, bases, and solvents. Save Your Asphalt Before It Puts Potholes In Your Budget! Challenges in the industry are causing asphalt prices to sky rocket. Making asphalt maintenance more important than ever. The power point below discusses what is causing the drastic increasing costs of asphalt.